It may be the summertime, but with the conglomerate of back-to-school commercials appearing on my TV, I am reminded on a daily basis that autumn is just around the corner. Autumn means pumpkin season, cooler air, colorful leaves, and of course, another round of cold and flu season. As beautiful as the fall season is, a simple sore throat can make it very frustrating to enjoy. Last year, as soon as the warm weather dissipated, a close friend of mine came down with a sore throat that was accompanied by severe pain. He had swollen lymph nodes on his neck and experienced headaches, nausea, vomiting, and body aches—he even complained that it hurt when he swallowed! These aren’t symptoms of your everyday sore throat—they are generally symptoms associated with strep throat, which affect adults and children typically around the fall season, winter, and spring. It’s something you should watch out for as the weather gets cooler and as your kids and grandkids head back to school. Strep is a throat infection caused from Group A streptococcus (GAS), bacteria found in a person’s throat, nose, or skin. You increase your risk of strep from smoking, heavy alcohol intake, heartburn, and an overall weak immune system. 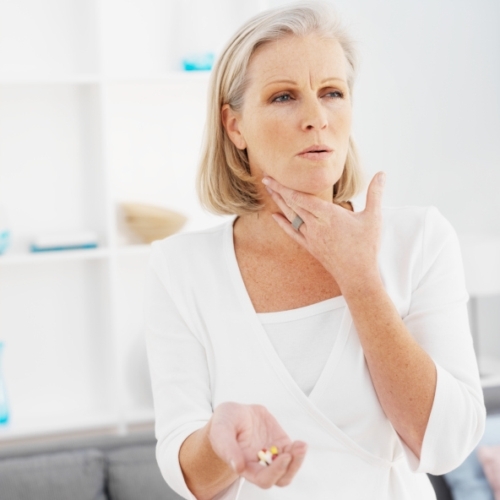 Strep throat is often the time people hit the panic button, and they may run to the doctor for antibiotics such as Penicillin and Amoxicillin. They may provide relief for a severe sore throat or strep throat; however, the downside of these drugs is that they are resistant to bacteria and don’t actually kill the infection that causes the strep throat. They also deplete important nutrients that are essential for immune function and overall health, such as good bacteria, B vitamins, vitamins A, C, D, K, zinc, potassium, calcium, magnesium, and iron. You definitely don’t want that to happen, but what’s the solution? BLIS K12 is a strain of bacteria known as an oral probiotic. BLIS K12 is also called Streptococcus salivarius, and the probiotic supplement can prevent pathogenic Streptococcus from causing bacterial throat infections. I recall a 2013 study published in the Journal of Expert Opinion on Biological Therapy. Researchers found that Streptococcus salivarius can benefit people with chronic strep throat and tonsillitis. The study observed 40 adults divided into equal groups—one treated with a probiotic supplement with Streptococcus salivarius for a three-month period, while the control group was left untreated. The Streptococcus salivarius contained five billion colony-forming units (CFUs). There was no change in the control group, but there was an 80% decrease in strep throat and tonsillitis infections in the probiotic group. There was also a 60% lower incidence of both conditions after a six-month follow-up with each study participant. There were no reported side effects from the probiotic supplement. Raw, organic apple cider vinegar is often considered the most effective natural remedy for strep throat symptoms. It is known to fight sore throat infections due to its antibacterial properties. The raw apple cider vinegar also contains the prebiotic inulin, which can boost your immune system with more T cells and white blood cells. Whenever you have a strep throat or a sore throat, gargle apple cider vinegar diluted in a warm glass of water. One to three teaspoons of apple cider vinegar in eight ounces of water is generally recommended. Slippery elm lozenges are highly used to reduce inflammation and pain, which can be linked to sore and strep throats. The mucilage from slippery elm trees are known to contain polysaccharides and protein, which can demulsify and coat any irritated area. It can also be an effective herbal remedy for coughs, skin ulcers, and digestive problems. The best way to improve strep throat symptoms is to build the immune system. To do this, avoid possible suppressants such as alcohol, caffeine, dairy products, and sugary foods. Vitamin A and C, zinc, thymus extract, colloidal silver, onion, pure honey, cayenne, and garlic can also support the immune system and relieve strep throat symptoms. Herbal remedies can bring relief as well. Try oregano oil, sage, Echinacea, goldenseal, marshmallow root, pelargonium sidoides, and licorice root. Peppermint, ginger, and cinnamon are herbs that are especially great for herbal tea. Finally, it is a good idea to consume plenty of liquids—homemade bone broths and eight to 10 eight-ounce glasses of clean, filtered water are a must! Gargling with salt water can also help with sore throat pain. Homeopathic remedies are great options too—apis mellifica, mercurius solubilis, and phyrolacca are remedies often recommended for severe sore throats. Adams, C., “Oral Probiotic Reduces Ear and Throat Infections in Children and Adults,” GreenMedInfo web site, April 21, 2013; http://www.greenmedinfo.com/blog/oral-probiotic-reduces-ear-and-throat-infections-children-and-adults. Balch, J., et al., Prescription for Natural Cures: A Self-Care Guide for Treating Health Problems with Natural Remedies Including Diet, Nutrition, Supplements, and Other Holistic Methods (Hoboken: John Wiley & Sons, Inc., 2004), 499-502. Di Pierro, F., et al., “Clinical evaluation of the oral Streptococcus salivarius K12 in the prevention of recurrent pharyngitis and/or tonsillitis caused by Streptococcus pyogenes in adults,” Expert Opinion on Biological Therapy, 2013; 13(3): 339-343. Bagley, K., “Natural Sore-Throat Remedies,” The Dr. Oz Show web site, October 14, 2013; http://www.doctoroz.com/article/natural-sore-throat-remedies. “Is It Strep Throat?” Centers for Disease Control and Prevention web site; http://www.cdc.gov/Features/strepthroat/, last accessed August 19, 2015. Cloe, A., “Will Probiotics Work With Strep?” Livestrong.com, last updated August 16, 2013; http://www.livestrong.com/article/445257-will-probiotics-work-with-strep/, last accessed August 19, 2015.